Last time I just reported to everyone that Ice Age 3 is the highest among the Opening box office in the Philippines for aqnimation. But guess what? Somebody just came in to steal that crown from 20th Century Fox's latest animated feature. Disney/Pixar’s latest comedy-fantasy “Up” took to the Philippine skies in record-breaking heights, opening at No. 1 nationwide. The critically acclaimed animated film rocketed to a five-day opening weekend gross of a gravity-defying P45.98-million for the Aug. 19-23 frame. The announcement was made today by Victor R. Cabrera, managing director of Walt Disney Studios Motion Pictures International. This installs “Up” as the new holder of the record for all-time biggest opening for an animated feature (besting 2008’s “Kung Fu Panda” at P38.4-M), even as it also beat the debut of the recent animated hit “Ice Age 3: Dawn of the Dinosaurs” at P36.5-M.
“Up” has likewise surpassed the openings of previous Disney/Pixar titles, notably 2004’s “The Incredibles” (P32.1-M), 2007’s “Ratatouille” (P29-M) and 2008’s “WALL-E” (P19-M). 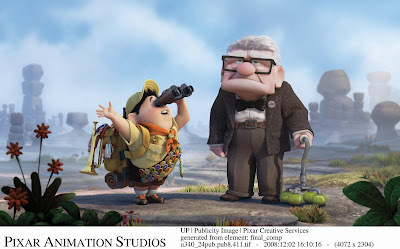 “Up” rolled out in 101 screens nationwide (15 of which were in Digital 3D, the remaining in traditional 35-mm format). The Top 20 cinemas with highest receipts are Trinoma (P3.34-M), SM North EDSA (P3.10-M), SM Mall of Asia (P3.09-M), Greenbelt 3 (P1.92-M), SM Megamall (P1.90-M), Power Plant (P1.82-M), Shangri-la (P1.72-M), Glorietta 4 (P1.51-M), Alabang Town Center (P1.49-M) and Robinsons Galleria (P1.384-M). Completing the list are SM Cebu (P1.383-M), Gateway (P1.24-M), SM Clark (P1.053-M), Eastwood (P1.052), SM Baguio (P951,967), Greenhills (P910,296), Ayala Cebu (P891,312), SM Marikina (P874,544), Robinsons Ermita (P823,254) and SM Iloilo (P711,112). “Up” follows the uplifting tale of 78-year-old balloon salesman Carl Fredricksen, who finally fulfills his lifelong dream of a great adventure when he ties thousands of balloons to his house and flies away to the wilds of South America. But he discovers all too late that his biggest nightmare has stowed away on the trip: an overly optimistic 8-year-old Wilderness Explorer named Russell. Their journey to a lost world, where they encounter some strange, exotic and surprising characters, is filled with hilarity, emotion and wildly imaginative adventure. 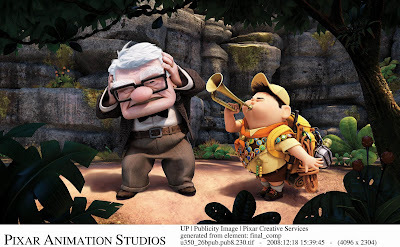 Still playing across the Philippines, “Up” is distributed by Walt Disney Studios Motion Pictures International.